There’s certainly more than enough choice to load up with, too. A large selection of wallpaper pattern books and displays to browse and choose from, a comprehensive range of paints, including designer paints, and of course all your decorating equipment. While you’re here, you can book an interior design consultation or arrange a site visit to discuss any tricky decorating decisions. We’re well placed to advise you, with almost 80 years of industry experience between our friendly, approachable team. 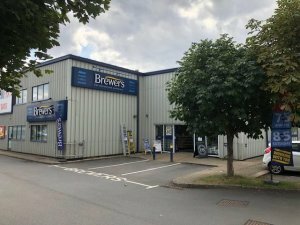 You’ll find the Aylesbury Brewers Decorator Centre on the Gatehouse Industrial Area. Gatehouse Way leads off the A41, Gatehouse Road. Head straight down Gatehouse Way to a T-junction, turn right, and then we’re on your left immediately after Screwfix. There’s more than enough parking outside and it’s easy to load up the van or car with your project necessities.